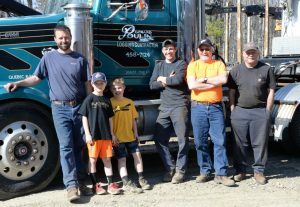 READFIELD, ME – Master Logger company Gerard Poulin & Sons has rolled with the times over the decades, and where they are now is literally a long way from where they were only a few years ago. For three decades beginning in 1980, the family logging business worked on big commercial timberlands in the Eustis area, cutting right-of-ways for roads, harvesting thousands of acres for major landowners, and running multiple crews that included many members of the Poulin family in addition to many employees. Founder Gerard Poulin was in charge when they began working there, and his sons were coming up in the business. 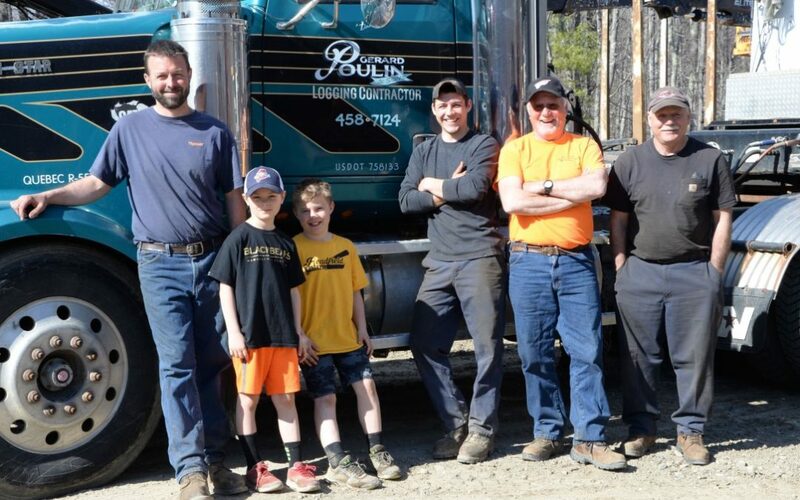 Today, Gerard Poulin & Sons consists of his two sons Larry and Gerry, Larry’s son Dana, and the brothers’ nephew, Andrew. The company is lean and efficient, and since 2011, the work is mainly near home base in Readfield. The Poulins go home to their families every night, they harvest mostly small private lots, and they’re happier. Gerard Poulin was a logger his entire life. At the age of 16, he moved down to Maine from Beauceville, Canada to work in the pulp mills. On the side he hauled wood in an old army truck with his uncle in Waterville. In 1959 he moved to Readfield where he did many land clearing jobs involving Interstate 95 power lines and shopping malls. As his sons grew up around his logging business, they eventually joined him. In 1980, International Paper Co. bought huge tracts of land in the Eustis area and Gerard realized there would be work for decades, so he told the boys they were going to work in Eustis. The Poulins went to work running multiple hand crews with cable skidders to cut the right of ways for the King and Bartlett Road and the Spencer Road before there was any harvesting done. They left the area in 1984 when the prices they were getting dropped and Gerard said it was time to go, but the brothers went back in 1988. Their move to mechanized logging equipment began in 1988 as well, when they bought a feller buncher with a shear head, switching to a saw head a year later. In the years from 1988 to 2011 the company would continue commercial scale logging in the Eustis region, moving over time to become fully mechanized with feller bunchers, grapple skidders and stroke delimbers. They were averaging 40 loads of wood per week, and as high as 60 in the winter. But the wood began to get smaller towards the end, it became tougher to be away from their families – particularly for Dana when his sons were born – and by 2011 when concerns about a radical environmental advocacy group possibly targeting logging equipment in the area arose they were ready to leave the area. Plum Creek hired them to move south to work in China on Plum Creek land. Thereafter they were hired to work on a power line project. “That”, Larry recalls, “was a great experience.” They added a Timberpro forwarder in order to lay mats. “When the power line job was complete, we decided to add a processor. We had decided that we did not want to go back up north. Dana’s kids were growing fast. We wanted to be home. And here we are! It’s much better being home,” Larry said. Today the Poulins run two Tigercat 822s, Gerry runs one with a buncher head while Dana follows in one with a processor head. Andrew runs the forwarder, and Larry is the truck driver, low bedding the equipment and hauling the logs. It’s efficient, it allows the company to be mobile and adaptable, and working mainly for small landowners they have become adept at harvesting while leaving behind healthy and well managed wood lots worthy of the Master Logger brand. Dana recalls first learning of the Master Logger program through the Professional Logging Contractors (PLC) of Maine, and the company was certified in 2013. “We figured it would be a good tool in the toolbox to have, especially doing smaller private lots down here in this area, and it has been,” Dana said.